It has been a long time coming but the zombie kangaroo film 'WATERBORNE' is here. Backed by a ton of indiegogo supporters this short film has huge potential to be a feature length especially in the wakes of the success of 'ZOMBEAVERS'. 'WATERBORNE' is like many other zombie movies where a local water supply is contaminated and the locals are in danger. 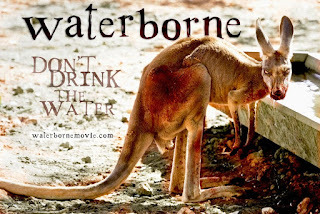 But unlike other movies its not the humans who are in danger from drinking the water its the local wildlife, in particular kangaroos who by drinking it become zombie-roos! Beautifully shot and using a puppet unlike no other, 'WATERBORNE' excels in giving us what we want, classic story line, good characters and the always reliable SFX. I would highly recommend this short and I for one prefer this over 'ZOMBEAVERS'. Be nice to see what this crew can do with a bigger budget.